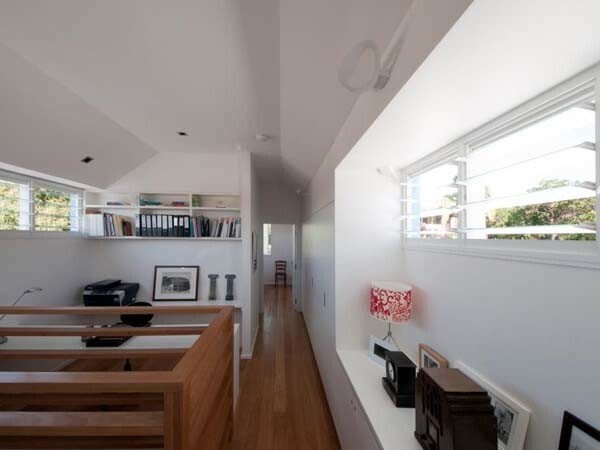 Breezway louvre windows were positioned in the living room of a 1920s timber semi house in Fairlight, New South Wales during its renovation. Designed by mm+j architects, the additions and alterations project at the Fairlight House included a new first floor, rear ground floor, decking and car parking. The original house facade facing the street was retained, and a new entrance created in the side elevation. High level Breezway louvre windows were installed in the living room above the bi-fold stacking doors to help create a bright and open area for the residents. This living space opens out onto the rear courtyard and a raised decking area allowing the residents to connect with their courtyard from the comfort of their living room. The louvres have been installed high up to allow free flow of air and facilitate good circulation even when the doors are closed. Breezway Altair louvre windows were installed in the bathroom to enable the wet area to be ventilated quickly when required. Louvres were also installed in an office area on opposite sides of the room to allow crossflow ventilation, which cools the space naturally without the assistance of artificial systems.